Now THAT looks fabulous! 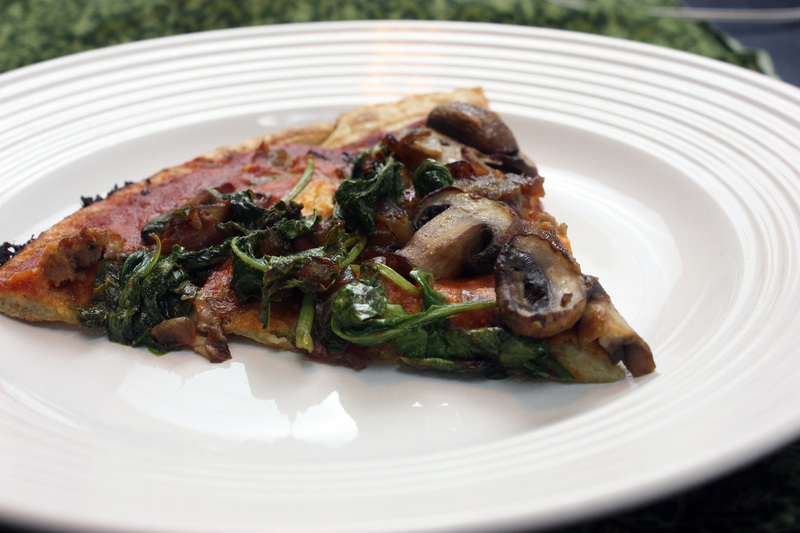 Quinoa in a pizza – who knew? this reminds me of a risotto pizza I make…but better! I am beyond excited! I will have to give this a go. This right here might be a total game changer! BOOKMARKED! Definitely can’t wait to try it — I can never get enough quinoa *or* enough pizza. Fantastic, Alta! You are the bomb, dearie! 🙂 I will definitely try this soon. I like quinoa and quinoa flakes, but not quinoa flour, so this is a perfect dairy-free recipe for me. I think I’ll try a variation of Lexie’s nacho cheese sauce on it. Excited! This sounds really easy and healthy. I’m intrigued! Alta, you have just inspired me to try making pizza. This is SO right up my alley, easy, uncomplicated, healthy, etc. And I have quinoa in my cupboard 🙂 I may have to experiment this weekend. I am definitely trying this, it sounds incredible. Gonna soak my quinoa tomorrow morning. Thanks for sharing Alta. Wow Alta, this looks and sounds too good to be true! Hmm, I have loads of quinoa, looks like I will need to try this. I actually have a quinoa mix that has these spices mixed in already – I think I have pizza crust in a bottle!!! Can’t wait to try this. Ummmm! I’ll give it a try. Thanks for sharing. This sounds so good. I am very excited to try it. I am also trying to cut unhealthy sugars out of my diet. I have gained weight since finding out I have celiac disease last May. and now I found out last week my 12 yr old son has it too. He was just devistated. I really would like to see what recipes she has so I can make good desserts that my son will like. This was a great find, wasn’t it? I actually dreamed about pizza last night, with tomato sauce and real cheese. This quinoa pizza is definitely the closest thing to the real deal I’ve had in a while. I am really excited to try this! It has been a loooong time since I have had pizza worth eating! I love this crust!! We have enjoyed it weekly at least! I have been following an elimination diet and discovered this crust is excellent as a flat bread and used it with sunflower seed burgers. I did vary the recipe some (use less salt and less oil) and my batch of 1.5 cups quinoa makes three 12″ pizzas. We also used it as pizza crust and topped with tomato sauce, fresh basil leaves and broken up sunflower seed burger. YUM!! Costco has a great price on Organic Quinoa. Mmmmm I’ve SO been missing delicious pizza. I’m new at this, so it might be a silly question…but would using quinoa flour work?? That is all I currently have in the cabinet. Thanks for sharing! I can’t wait to try this! I’ve been missing pizza and found most crusts I’ve tried don’t cut it. Any way to make this without a cast-iron skillet? You totally can! The recipe I based mine off of called for a cake pan – I bet a 9-inch would work. You’d probably want to lessen the batter – you might even be able to split it between 2 pans. Just don’t heat them for so long in the oven like you would a cast iron skillet. A few minutes is all you’d need. Katie, I honestly have no idea. I have some as well – I might try blending it with water to see! If you try it, let me know. Wow! That’s all I can say: Quinoa is one of our favorite grains and now will be our pizza crust main ingredient? Would have never thought of it until reading your post. Thank you for sharing. Soooooo good! Made this crust this afternoon, cut in half for one pizza and made it in a 6 in pan, crispy on outsides but still soft in the middle — can you say yum?!? Topped it off with grilled chicken, sauteed onions and mushrooms, Parmesan and homemade pizza sauce. Think I’m going to make a variation tomorrow – goat cheese, olive oil, wilted spinach and roasted butternut squash! Can’t wait! Thanks forcing wonderful recipe!!!! Love that you used quinoa for pizza crust. Sounds like a light alternative to the heavy ones that I do not eat anymore.